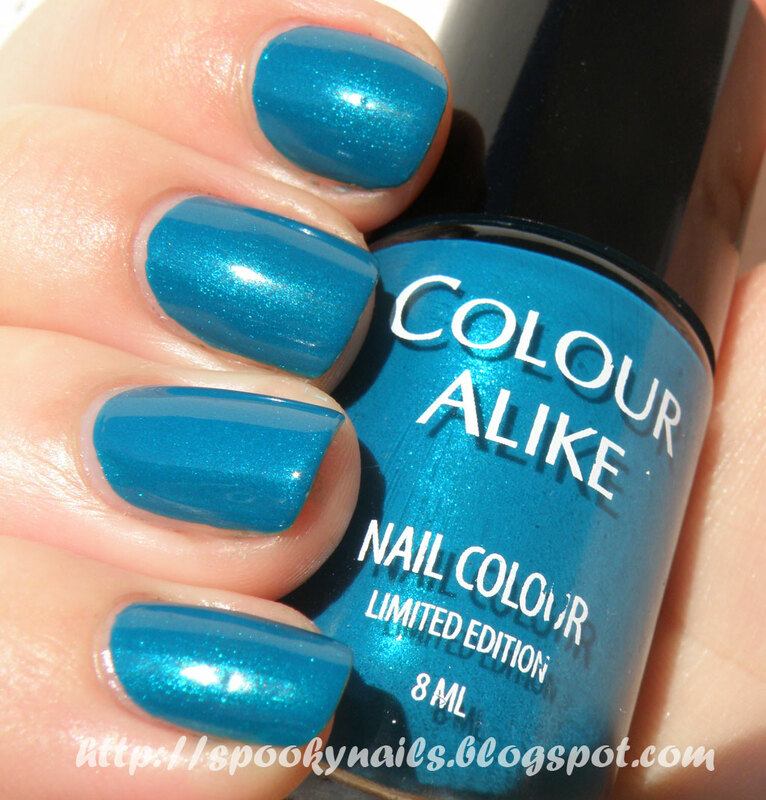 Ha – this name is hilarious ;) Colour Alike is a Polish brand (Polish = from Poland ;) ) similar to Catrice, producer is Barbra Cosmetics. It is cheaper than Catrice, but I think that quality is little better. It is the only Polish brand I know with polish names! Most of polishes in my country has only numbers -.- Ohhh noo, we hate numbers -.-. Bottles are pretty and minimalistics, brush is is very handy – it is wide like Catrice brush but it is more flexible and I like it more. First polish I tried was 445 Panna z mokrą głową (it means Miss With a Wet Head – we had a very popular movie with that title http://www.imdb.com/title/tt0110767/ ). Funny thing is that customers chose names for the polishes on Facebook! :) Good job Barbra Cosmetics! :) They have also dupe of Chanel Paradoxal, but I will show you this one later. You can find them here: shop. Panna z mokra głową is a very veeryy beautiful turquoise (or just blue?) with a gorgeous shimmer *. * It dries in few minutes and it can be a one-coater as well! I have 2 coats on my nails and no topcoat. Weather is beautiful today, so I have photos in direct sunlight. Isn’t it gorgeous? Z bliska – cień / słońce / bezpośrednie słońce – kliknijcie aby powiększyć. Close up – shadow / sunlight / direct sunlight – click to enlarge the photos. U siebie widziałam je po 12-13 zł. U mnie w sklepie sa za jakies, 9,50.
my husband is obsessed with Polish nail polish. He goes around saying Po-lish Pol-ish, what do they call pol-ish in Poland? Po-lish Pol-ish. Men are stupid.